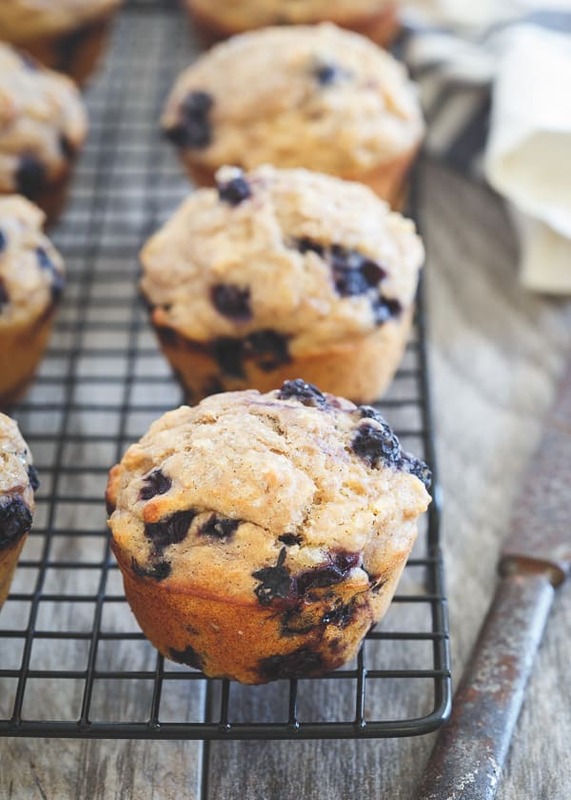 These blueberry ginger muffins are 100% whole wheat and made with wild blueberries and Greek yogurt for a healthy, superfood packed breakfast or snack. Before we left for Mexico, Ulysses got a cold, my sister in law was sick for the first couple days of vacation and then my brother caught her cold the last two days. On the airplane, it felt like literally every single person was either coughing, sneezing or sniffling and I just wanted to go bubble myself up in my hoodie away from all the damn germs! I think I used more hand sanitizer Saturday alone in the 12 hours of travel time it took to get home than I have all year long. Miraculously (let’s hope I’m not jinxing myself), I’ve somehow avoided sickness so far this season. Either I’m on a lucky streak or all those burpees on the gym floor, face to face with other people’s shoes, sweat and god knows what else have boosted my immune system with something akin to anti-sickness superpowers. Since I’m sure it’s probably the former though, I’m getting the superfood arsenal ready for when it does happen with these wild blueberry ginger muffins. Wild blueberries make berry cravings in the middle of winter possible. Or at least possible without paying and arm and a leg for out of season, gross tasting fresh berries from another hemisphere. This tiny superfood fruit is packed with antioxidants even more so than a traditional blueberry because of the harsh growing conditions they thrive in (they’re native to places like Maine and Canada). They’re frozen upon harvest and almost always sold that way, making things like blueberry ginger muffins in the middle of January not only possible but still just as delicious as if it were mid-summer. I’ve been loving Greek yogurt in baked goods lately (like these Greek yogurt Christmas morning muffins – not just for Christmas though!) and decided to go that route along with whole wheat flour to really make these one heck of a nutrient powerhouse breakfast or snack. The touch of ginger helps balance the sweetness making the overall flavor something so perfect it almost makes me wish for a little sniffle for an excuse to whip up another dozen. 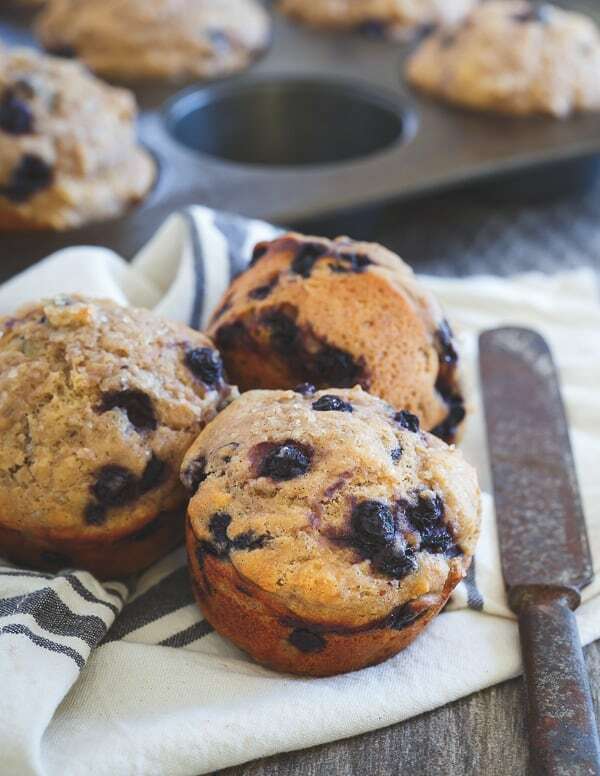 Love these whole wheat wild blueberry ginger muffins? Try other muffin recipes such as Whole Wheat Sweet Potato Banana Muffins, Paleo Pumpkin English Muffins, and Lemon Chia Mini Muffins. Preheat oven to 400 degrees. Grease a muffin tin with baking spray. Combine flour, baking powder, salt, spices and crystallized ginger in a medium bowl and whisk together. Whisk together eggs, yogurt, almond milk, maple syrup, coconut oil and vanilla bean paste in a small bowl. Place the wild blueberries in a fine mesh strainer and rinse under cold water to thaw until the water runs almost clear. Shake excess water off and add the blueberries to the batter and gently fold in. Scoop the batter evenly into 12 muffin tins. Top with turbinado sugar if using. Bake for about 20 minutes until muffins are springy to the touch and just starting to brown around the edges. Remove from oven, let cool in tin for 5 minutes before removing to a cooling rack. Oh how I wish I had one (okay, three) of these right now! They look absolutely perfect, and I love that you paired blueberries and ginger. Yum! These look healthy and fabulous, yum! Can I also say I love your very cool and rustic (rusty?!) looking knife!! Being on a plane surrounded by sick people is the worst, here’s hoping you don’t catch the cold. I absolutely love these muffins! Blueberry is my favorite and the added ginger makes them even better! Love the blueberry ginger combo – can’t believe I’ve never tried this before, I love them both so much! 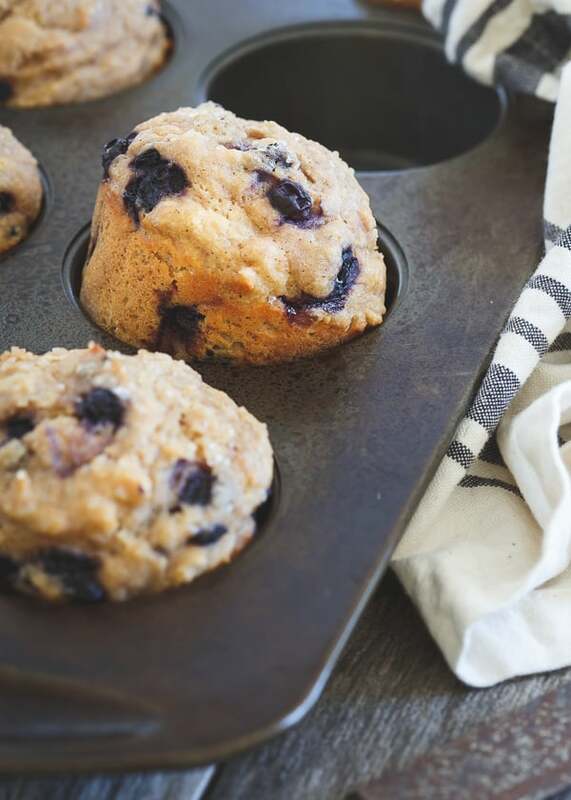 These blueberry muffins are textbook perfect! I love the addition of the crystalized ginger and the greek yogurt! These look awesome! And maybe a muffin a day keeps the doctor away? Here’s hoping! Also side question- love the layout of your blog did you use a specific designer? These look awesome. I was looking for a muffin recipe that used whole wheat. Thanks for sharing this delicious treat!